As you can probably tell I love Valentine’s Day, it’s been so fun baking with my favorite color pink! 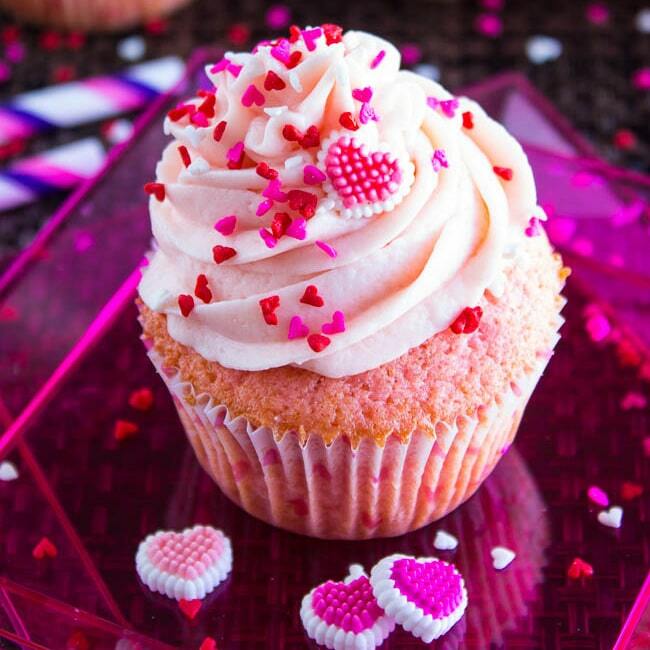 And these Pink Heat Cupcakes just scream Valentine’s Day with a pink vanilla cupcake, icing heart decorations, and SPRINKLES! I started with my favorite vanilla cupcake recipe,and transformed it a bit, adding pink food coloring to make them pretty and pink. I topped them off with a delicious mound of vanilla butter cream frosting and of course, SPRINKLES! 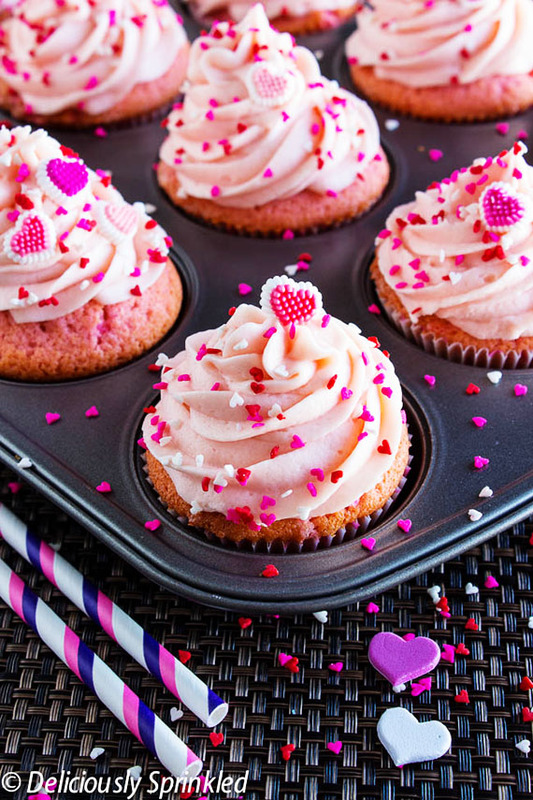 These Pink Heart Cupcakes make a perfect treat for your Valentine and I guarantee they will love them! Preheat oven to 350F degrees. Line 12 count muffin pan with cupcake liners. Set aside. Using a electric or stand mixer, cream the butter, sugar and food coloring until light and fluffy. Add eggs, one at a time, beating well after each addition. Beat in vanilla. In a medium bowl, whisk the flour, baking powder, baking soda and salt; add to wet mixture alternately with buttermilk, beating well after each addition. Fill paper-lined cupcake cups two-thirds full. Divide batter between 12 cupcake liners and bake for 20 minutes or until a toothpick inserted near the center comes out clean. Allow to cool before frosting. Mix softened butter on medium speed with an electric or stand mixer. Beat for about 3 minutes until smooth and creamy. Add powdered sugar, cream, vanilla extract, pink food coloring and salt. Increase to high speed and beat for 3 minutes. Frost cooled cupcakes (I used Wilton 1M piping tip). So playful, so pretty, so perfect for Valentines Day! Love it! I’ve featured these lovely cupcakes on my blog, hoping that you don’t mind, but if you do, please contact me and I’ll remove it. All the best.